We have adapted some of our greenhouse benches (tables) to be heated by radiant hot water. They are enclosed in a little “greenhouse within a greenhouse.” What you see on the left in Nick laying out the tubing on the benchtop. All the way on the right is me plugging in the tubing to the hot water distribution system. And in the middle you’ve got Kate rolling down the greenhouse plastic over the hoops. Tonight is the first night that we will have some trays hanging in there. We’ll monitor how they do and tune up the system as we go. 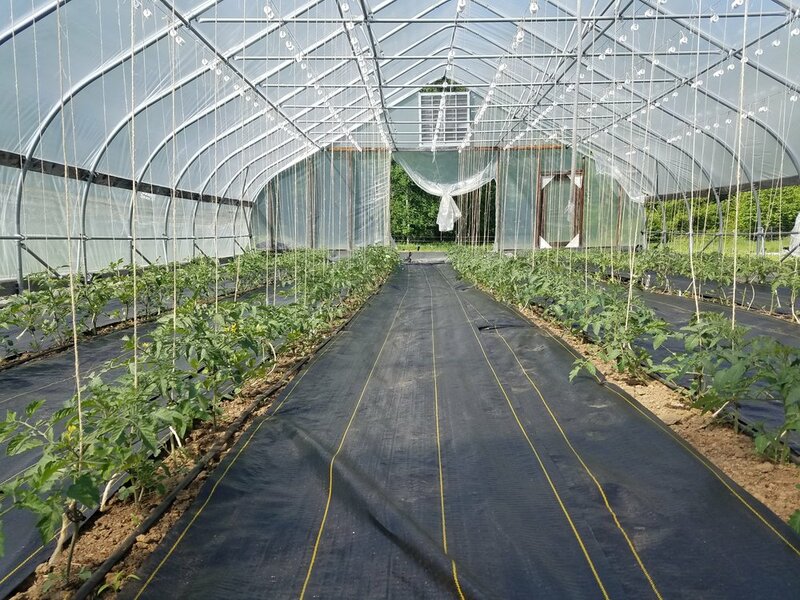 The goal is to have it really dialed in for tomato seedlings in a few weeks, so we can keep them warm and happy in there, while maintaining low greenhouse air temperatures, and saving energy! With the longer days, the spinach growth has taken off and we’re finally able to harvest enough of this sweet stuff to please most of our weekend shoppers (Midcoast Winter Farmers Market every Friday 11-4, Brunswick Winter Market every Saturday 9-12:30). And the ladybugs were loving it in this shot from Valentine’s Day. We release them somewhat regularly to eat aphids, but this year we’re starting another strategy called aphid “banker planting.” Right now we are actually raising aphids in the house on some barley plants inside a “Bug Dorm” (net tent). The species we are raising only feed on grasses and grains, but having them will allow us to also grow a population of parasitic wasps called Aphidius colemani, and they eat the green peach aphids that are a pest on our greens! Next time hopefully we’ll have some action to show you from those banker plantings. The Robinhood Free Meetinghouse is a really special place in Georgetown. An old church on the National Register of Historic Places, you can hang downstairs with us at the casual bar and restaurant, then head upstairs to the beautiful sanctuary for the concert. We’ll take a set break and have a drink downstairs, then head up for a second set of music. The soup you can get on Saturday will feature our farm’s butternut squash and onions. In other news, we’re busy at work on the farm getting the greenhouse up and running for the year, with our new hydronic bench project (radiant heat under the nursery plants, a sort of greenhouse within the greenhouse which will save us fuel). We’ve started our first seedlings in the barn on heat mats, then it’s on to the germination chamber in the greenhouse, then to these benches, and finally when we’ve run out of space there, back to our big greenhouse that we’ve always used. But hopefully with significantly-reduced energy use. Next time we’ll have some pictures of baby plants growing in the greenhouse! Happy New Year from all of us at Whatley Farm! After a relatively warm and sunny holiday season, winter is finally settling in here. Lots of ice on the ground and a few days where it looks like it won’t get above freezing. But the ducks are bedded down with straw in their hoophouse, and the greens are tucked under double row covers…and we’ll keep the home fires burning. New winter market opening this Friday! On the farm, we planted a lot of garlic as usual! 18,000 little cloves, which fills about 3/8 of acre (in 30 beds 100’ long, 3 rows per bed, 6” apart in-row)…this is only a slight increase over last year in terms of total quantity, but we are planting a lot more of the variety Music, as well as expanding a great new variety which we haven’t offered for sale yet: Georgian Crystal. It’s one of the biggest and most beautiful bulbs we’ve ever laid eyes on…stay tuned. 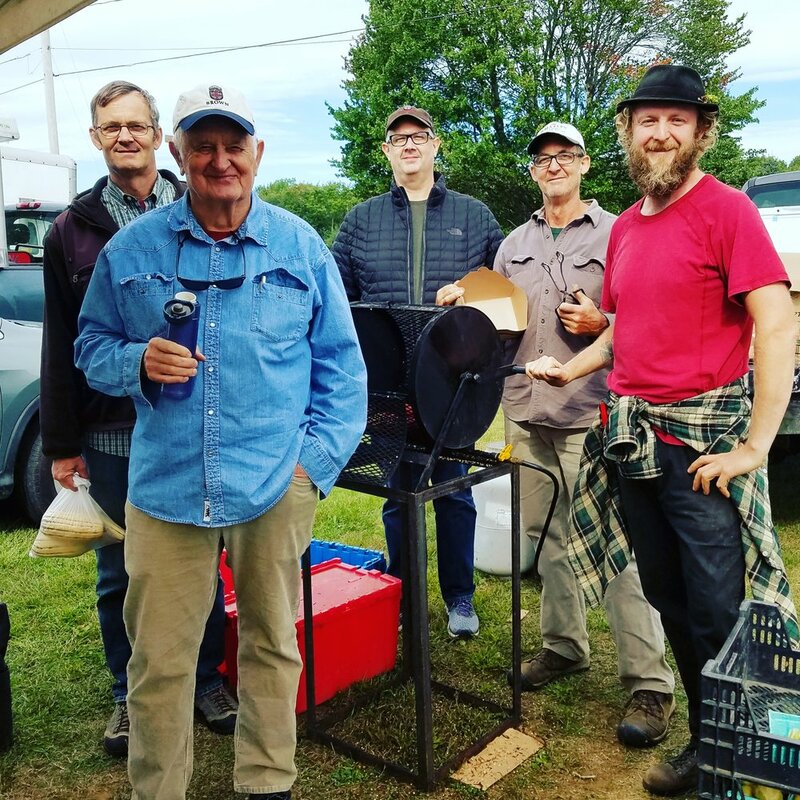 Saturdays: Just one more market at Crystal Spring Farm this Saturday 11/3, then starting Saturday 11/10 at Fort Andross, it’s the Brunswick Winter Market. The Tamworth breed of pigs also produces an exceptional quality of meat with just the right amount of fat. We enjoyed a slow-cooked shoulder roast the other day, and we’ve been getting great reviews on the pork chops too! We have a full selection of cuts at market, including nitrate-free bacon and ham steaks. 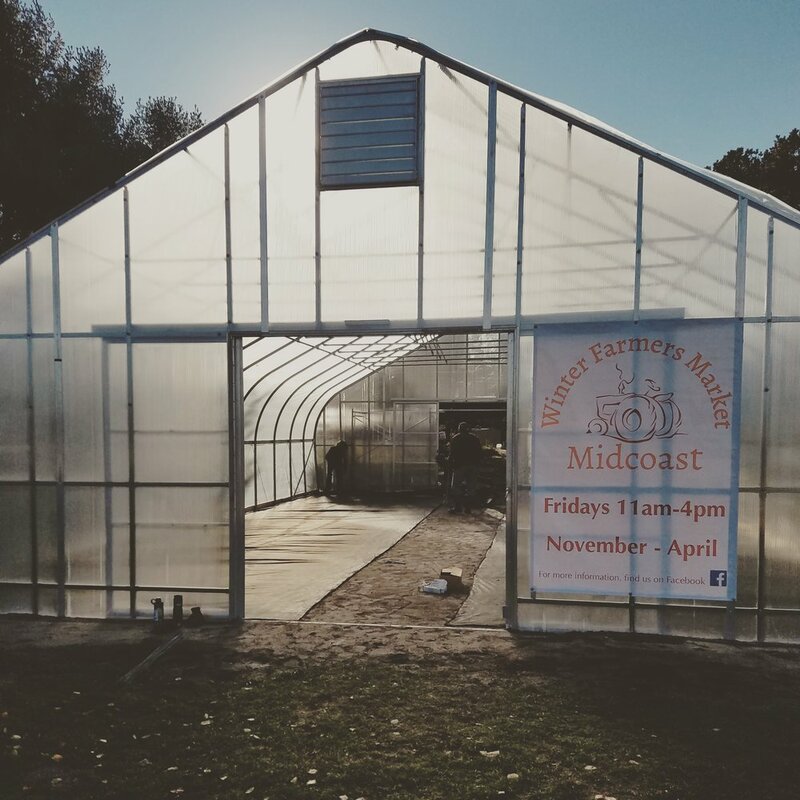 Have you heard that our Midcoast Winter Farmers Market is moving to a new location at Brunswick Landing? 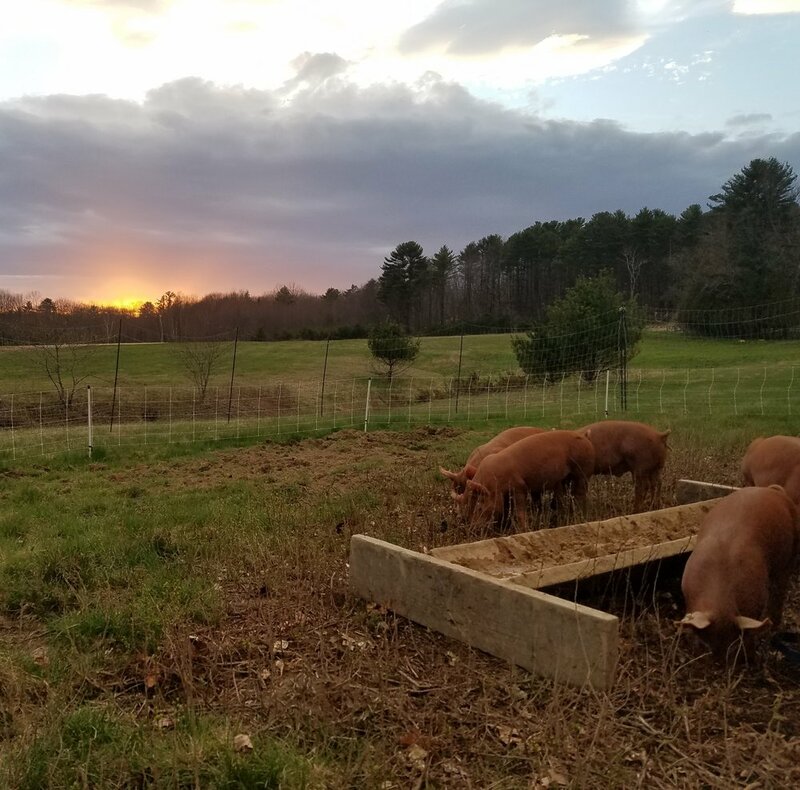 We’re very excited about the partnership with Turtle Rock Farm, who is hosting us at their commercial kitchen at 39 Burbank Avenue. We are constructing a heated greenhouse which will be connected to the main building by a covered walkway, and which will hold many of the vendors. Others will be inside, where you will find the Midcoast Market Cafe featuring lunch options and Big Barn Coffee. 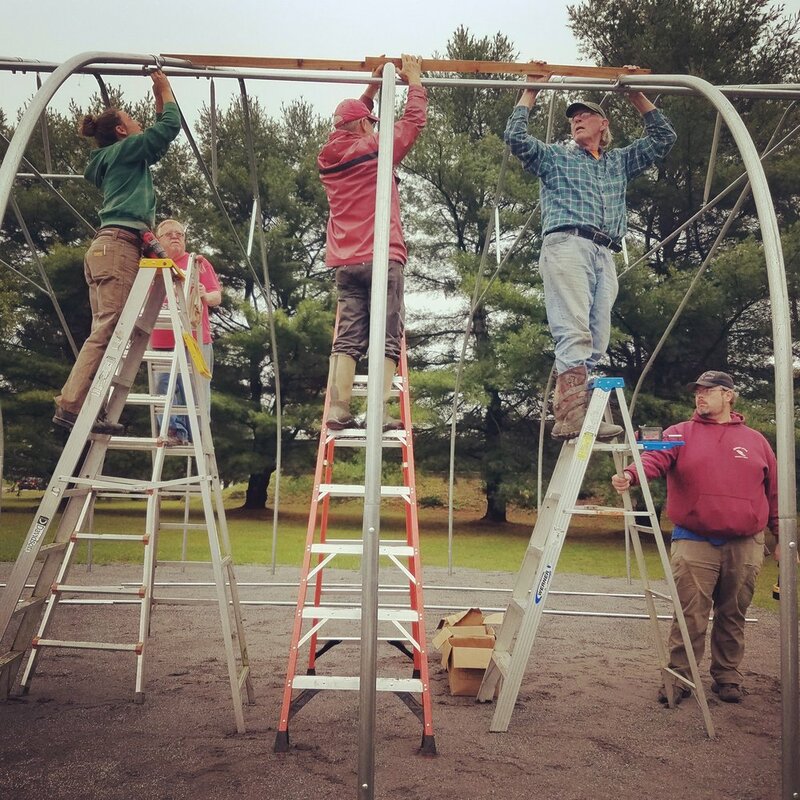 There are other exciting things happening on the campus too, including an outdoor pizza oven being constructed by Turtle Rock Farm with students from Harpswell Coastal Academy. Come check us out every Friday from 11-4, starting November 2nd. 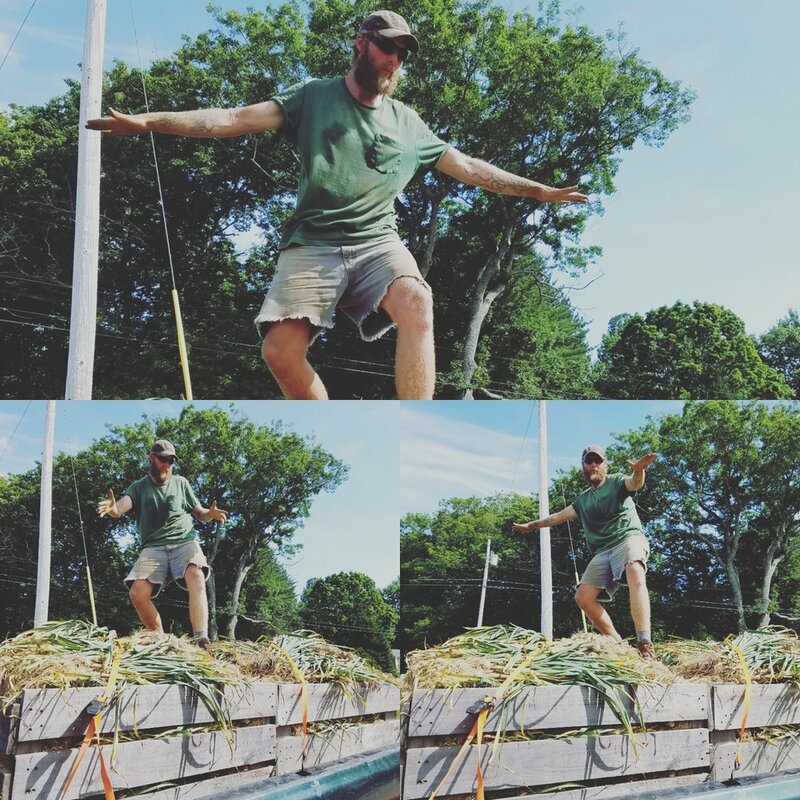 I’ll leave you with a smile from our friendly crew cleaning garlic today! Come see us some Tuesday or Friday downtown, or Saturday at Crystal Spring Farm. Seed garlic ordering is open, and lots more! We are making lots of value-added products for the the winter, too. Turtle Rock Farm and cannery made a double batch of our Heirloom Salsa (Medium, with Jalapenos, Sweet Onions and Garlic) today. The Hot version with Serranos is next, along with lots of Salsa Verde (this year in Medium and Hot). Turtle Rock did a big batch of Tomato Puree (Red and Gold), and we're roasting peppers now at market too! If things work out, we're heading into the kitchen next week to roast and freeze cherry tomatoes for winter sales, as well. They say if you blink, you might miss the Maine summer, but here we are in the middle of a heat wave! 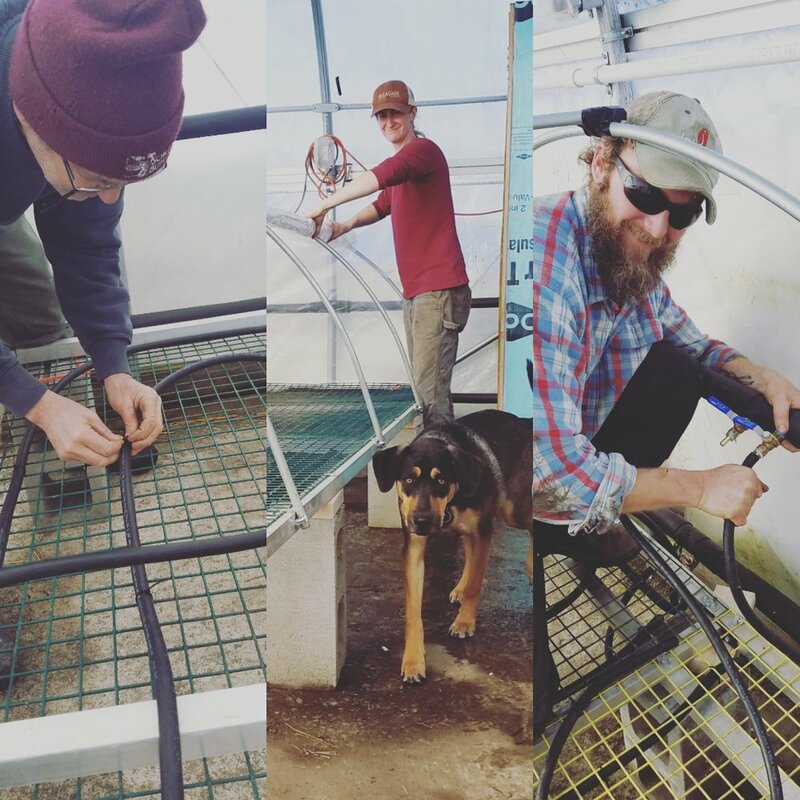 Ben has been working on a greenhouse over at Turtle Rock Farm's new campus at Brunswick Landing, which will be the new home of the Midcoast Winter Farmers Market! We decided to pick up our stakes and move over to this exciting new redevelopment project at the former Brunswick Naval Air Station. Here's Joe Murray from Dragonfly Cove Farm, and me, pounding ground posts this morning! We'll be open Friday, November 2nd. In the meantime, don't forget summer markets which run right on through. We'll be roasting peppers this Saturday! 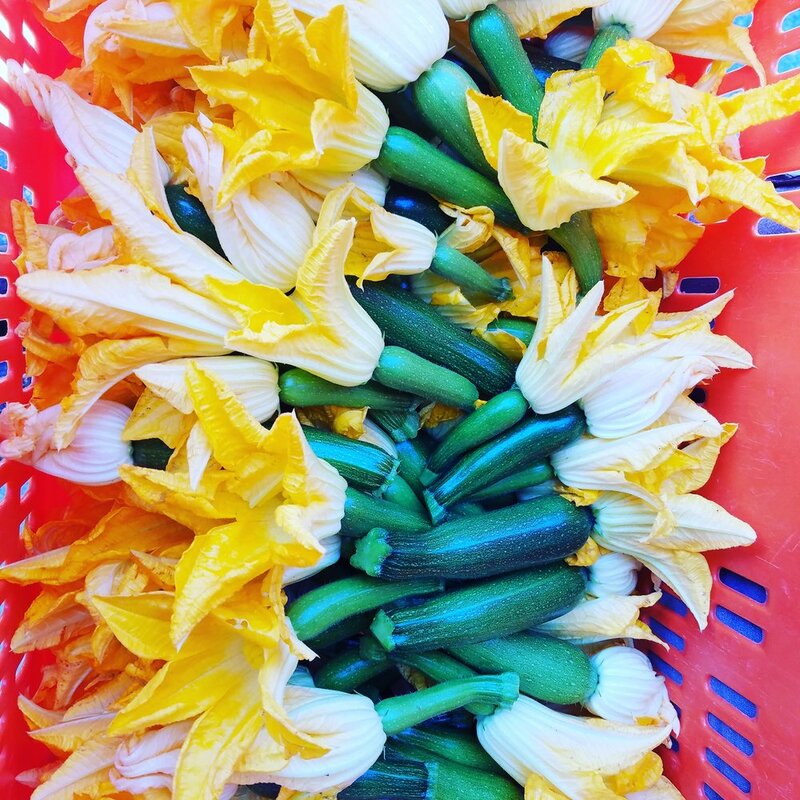 Those are baby zucchini with nice, open flowers attached...we have been selling zucchini flowers to a couple of restaurants, and occasionally at farmers market too. These were a special treat for Enoteca Athena, the Brunswick Inn, and a few lucky market customers. Stuffed with goat cheese, lightly battered, and pan-friend. Mmm good. This is Emma with some red leaf amaranth, which we picked for the first time today! It is a mild-spinach flavor, which is tender and oh so pretty. 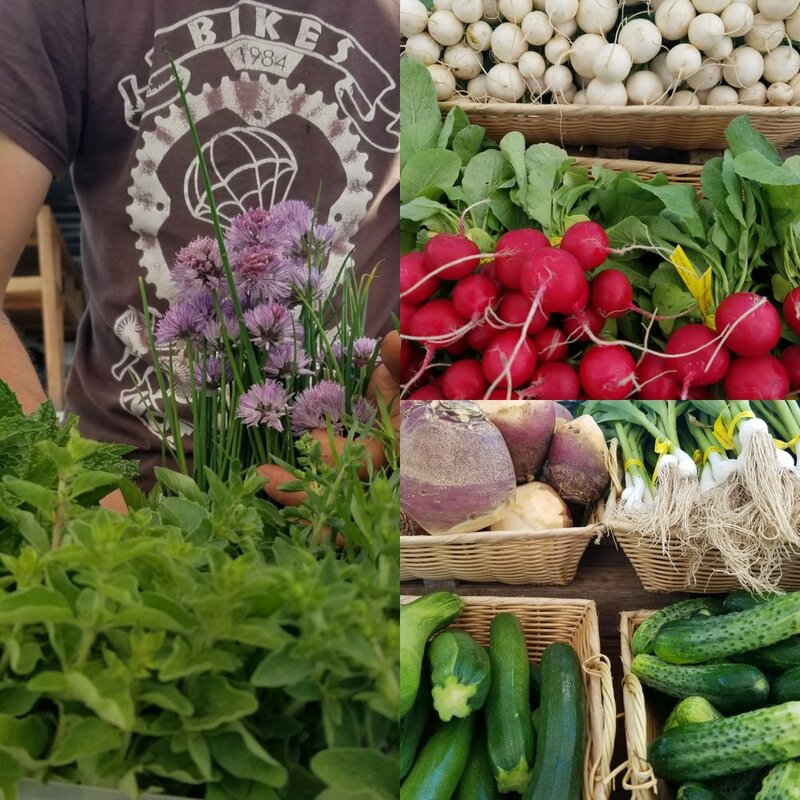 We ate it as a salad today, along with some lemon-miso summer squash and pesto pasta...By the way, did you know we have some great deals on fresh basil right now? 1# bags of clean tops with very little stem. Makes a lot of pesto! Freeze some like we do, leaving out the nuts and cheese until you take it out in the winter. And of course, we always have other projects we're trying to get to...our masonry pizza oven build is on track for next weekend. I've been cleaning up some old timbers and getting them ready to frame up the shed, which will cover the oven. It's going to be fun. All the talk among the farmers on the Maine listserves this week has been about drought and whether we should get used to a more Mediterranean, or California-style farming...the last 2 summer have been dry and so far we haven't had more than 1/2" of rain, all spring! Irrigation is the name of the game, and I'm starting to believe that Maine is now like much of the rest of the country, where the motto is, "If you can't irrigate it, don't plant it." We used to be able to rely on spring rains to establish crops, and many things grew without irrigation...we're adjusting! Of course, we're making it rain where we can! And these healthy seedlings which we're bringing to market are ready to go. New things and fresh rounds of tomato plants every week. Husk Cherries are going in the ground tomorrow while I'm at market, and lots of seeding! Always something going on around the farm.